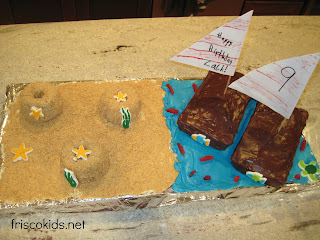 Yesterday you saw my personal cake wreck, the sand castle cake. This cake was Plan B, and much simpler. For this cake, Zack wanted a sail boat cake and beach. I wrapped a board with tin foil, and covered half of it with white frosting. After grounding up graham crackers in the food processor, I spread them out on the frosting. The little sand castles are mini Bundt cakes, drizzled with microwaved frosting and rolled in the graham cracker crumbs. My kids thought they looked more like sand hills rather than sand castles. Whatever. I colored the rest of that frosting can blue, and spread it out as water. The sail boats are half-filled bread pans of cake. If I had more time, I would have decorated the boats to look more like boats. And they would have been mini bread loaf size. And if I had talent with fondant frosting, I would have made people. The kids had fun decorating with store-bought sea life decorations, that we got at the grocery store's baking section. At the party, these were the decorations all the kids begged to eat. 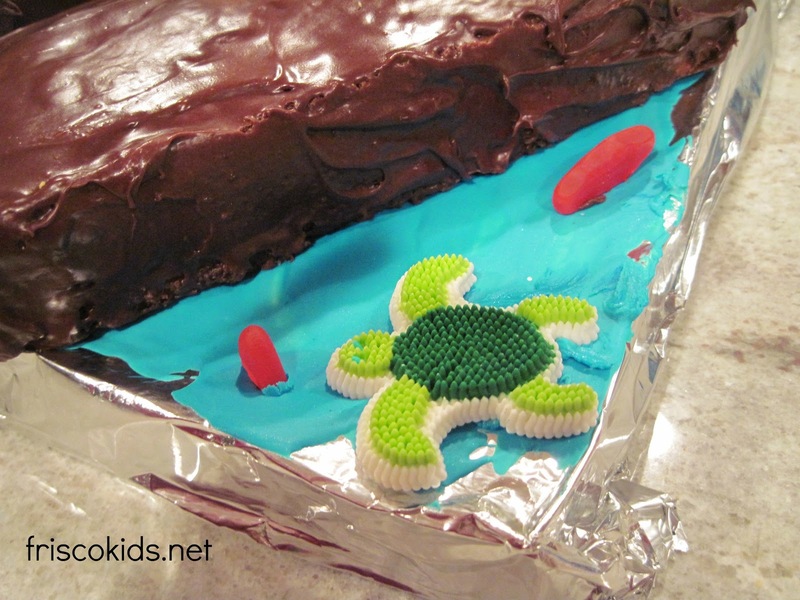 Plus my kids added Swedish fish (which they sometimes cut in half so it looked like they were poking out of the water).